Hi Bryan, I have read https://www.youtube.com/watch?v=A07CBHXq75A I was wondering, are there any codes on github where one could execute an indicator from MT4 or Tradingview via Java, or instead of executing orders, receiving buy sell signals via sms from an MT4 or tradingview indicator, via java, on an sms? How would you construct such indicator? My answer is in the video but in a nutshell: always use the market data of where you trade or submit orders. Everything described is in this future. Also, in this video I addressed the changing situation of brokers due to their Python API support. One example is how Dukascopy seems to become irrelevant since more people want machine learning in their trading. It seems they seek Python for this. You can find all these answers towards the end of the video . This entry was posted in Quant Development, Trading and tagged broker, data, different, market, MT4, tradingview on September 25, 2018 by caustic. Reminder about tonight but don’t forget about the Interactive Brokers big news announced last week. Send in your questions in right away to get them answered so I can prepare! Remember that Interactive Brokers has eliminated their minimum $10K requitement. As you an imagine, this makes my Interactive Brokers valuable now! I plan to add new content to it as I explore the Python options for my strategy. I no longer need to support Oanda nor Dukascopy options as we I have worked on earlier this year. It is straight to what I call the end game of Interactive Brokers for my ultimate global broker! This entry was posted in Forex, Quant Development and tagged convert, ForEx, Interactive Brokers, MT4, programming, Python, Tonight: How to, webinar! on August 27, 2018 by caustic. An interesting topic came up today so let’s talk about it. How does one convert Metatrader 4 or 5 (MT4/5) to Python? This while we are in the world of Forex. In fact, we can talk about my experience with Dukascopy, JFOREX, and their Java API. This entry was posted in Quant Development and tagged convert, ForEx, how to, MT4, programming, Python, webinar! on August 24, 2018 by caustic. After accomplishing the latest set of charts to generate both a long and short term view on forex pairs, the next challenge is determine what is happening to them when they consolidate. It seem the financial pros use many type of trading patterns to determine potential pricing action. This enables traders to see if any currency pair will have a breakout moment to perfect time a market entry. There are so many different patterns but I have identified the ones NicTrades uses most often. After reviewing the rationale behind them, it makes sense to test them out. As I am using JForex, it seems this pattern functionality is rather limiting in the platform. It is also not quite as advanced in other platforms including Metatrader 4. I even tried looking for coding samples in Python. Unless I use machine language for chart pattern recognition, the choices are somewhat limited. I am also finding to try machine learning at this point will only further delay the implementation of my automated trading. It will be a nice to do this project later in the near future but I will not be able to do it right now. Being on Mac has its advantages but I will tell you it can limit youth certain software. Metatrader is one of them. You can attempt to run a ‘MacOS’ version through a Wine packaged version. The brokers out there do a poor job at this. I tried running the one from FXPro but it did not run. I did get a version running from XM but they seem to be an unreliable broker being based out of Cyprus. They also take European only customers as well. These were the only ones I tried so I will not further waste anymore time going down this path. Also, I still refuse to run anything on Windows as it is just seems to run like a dog. I even tried running Linux via a virtual machine but I still would rather put staples in my head. Note that I did find 3 MQL4 scripts that prove to have all the trading patterns I would like to try. Then I had this Eureka moment! Why not hire someone to translate these MQL4 scripts into Python 3? It should be a problem to find people through this ;community’ since Metatrader/MT4 /MQL4 is super popular. It also involves simple math judging from the source code. There may be some wonky translation of charting code to something within a Python Matplotlib package. Up for a challenge? If so, get in touch with right away. This entry was posted in Forex, Uncategorized and tagged convert from, help, MT4, Needed, Python, Trading patterns on February 23, 2018 by caustic. whats ur opnion jforex 3 ? is it better than metatrader four right sir ? and why ? This entry was posted in Forex and tagged algo, Dukascopy, Europe, ForEx, help, JForex, MT4, tip, trading on January 11, 2018 by caustic. This entry was posted in Forex and tagged algo, Dukascopy, Europe, ForEx, JForex, MT4, trading tips on January 10, 2018 by caustic. Do you ever see those videos where some trading guru in a video sits in front of 20 million billion screens? I mean does it make them really a lot more bank? LOL You going to fall for that? Once again, another out of control retail trader who thinks 18 screens will make him a millionaire. I love the thought process! Starting next week I’ll be putting out a few reports to help me cover all those frequently asked questions from newbies on starting out in automated trading and/or proper trading. Be on the lookout for that. There’s some really good videos and it will have some automation surprises. The unfortunate thing is it involves Windows 10. Do not forget about FREE DAILY DIGEST so you can keep up with my daily news/research coverage. There will be lots coming down the pipeline. This includes the workshops I mentioned including my research on Apple Swift for IOS devices for front end graphical user interface development. This entry was posted in Forex and tagged ForEx, MT4, screen, system, tour, trading on October 7, 2016 by caustic. In the link below you will find one of my members who had some experience with the Java API from Oanda. Not only that, he also expressed his frustration with MT4 also known as Metatrader which is the most popular foreign exchange trading platform out there. You already know that any unknown broker that supports this platform should be considered a red flag who will likely screw your account. I would be highly interested to hear about any recent feedback some may have had with this broker or their API. They’re the only ones that I would trust from an independent broker’s point of view. I’m hoping in the next couple of weeks I will be able to announce some all-day LIVE coding workshops for specific topics. A popular one would definitely be about trading execution with Interactive Brokers software and gateway. As most people work, I would figure that Saturday or Sundays would be the most popular choice for these workshops. Do let me know what you think. I’m happy to report that three quarters of my FX strategy is coming together. I’m hoping in the next couple of weeks I’ll be wrapping all of this up to revisit my Python scripts for both futures and options trading. There seems to be a need to make these more robust. As a result, is it possible that my new service may be coming online sooner than I think? If so, many new services and product lines will be coming out of it but all of this still needs to be determined. 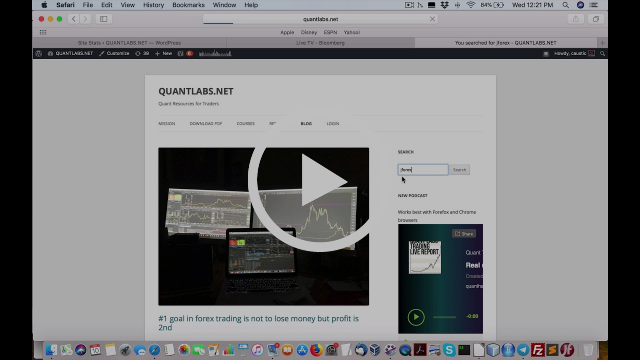 At the end of the day, it is highly recommended you to jump on the current Quant Elite membership while it’s still affordable. Also do note that these upcoming workshops will be included as another benefit for this membership. This entry was posted in Forex and tagged API, blow hard, ForEx, MetaTrader, MT4, Oanda, system on September 22, 2016 by caustic.